We are trying to get back into the swing of things – when it comes to school. To ease us back in we mostly did Valentine’s activities. We read Saint Valentine by Robert Sabuda. The pictures in the book are beautiful paper mosaics. 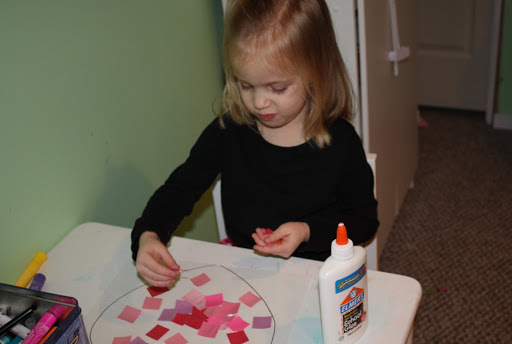 Norah made a heart mosaic. Although very simple, this activity was a huge hit. What 4 year old doesn’t love glue and paper?